Description - Acacia Valley beautifully captures the unique look and variations of real hardwood floors with the durability and life of a porcelain tile. The warm color palette adds a modern rustic touch to any room. Unlike real hardwood flooring, porcelain tiles are nearly maintenance free and can be installed on, above, or below grade. 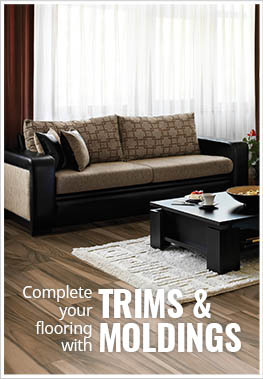 With rectified edging, the look of natural hardwood floors is even more realistic. Material – Body Match Porcelain tile with rectified edges. Size – 6" x 36" or 9" x 36". Application – Floors, walls, countertops. Breaking Strength – >275 lbs. Case Weight – Each case weighs ~64 lbs. Recommended Uses – Acacia Valley wood porcelain tiles can be installed on any level of the home and are ideal for a variety of spaces. Some spaces are kitchens, dining rooms, bedroom, small retail shops and boutiques, bathrooms, and more. Glazed tiles should be cleaned routinely with an all-purpose, low VOC household or commercial cleaner. The entire area should be cleaned and scrubbed with cleaner solution by using a cotton mop, cloth, sponge, or non-metallic brush. Routine cleaners should never contain hazardous or polluting products including, but not limited to acids or ammonia. Acids can damage the grout and the glazed surface of the tile, while ammonia can cause discoloration of grout. When complete, be sure to rinse the entire area with clean water to remove all cleaning solution residue. For detailed cleaning instructions, please Click Here. Tile must be installed over structurally sound substrates. Any damaged, loose or uneven areas must be repaired, patched and leveled. Start by marking the center point of the room. Place a row of loose tiles along the center lines in both directions, leaving enough space for uniform joints (use tile spacers). Using the notched side of the recommended trowel, comb adhesive into standing ridges by holding trowel at a 45-degree angle. Remove excess adhesive, leaving a uniform, ridged setting bed. Never spread a larger area than can be set in 15 minutes. Measure tiles to be cut carefully and mark with a pencil or felt-tip pen. Make straight or diagonal cuts with a tile cutter and curved cuts with a nipper. Be sure to mix tiles from several cartons as you set, for a blended effect. Begin installation in the center of the room. Finish each grid before moving to the next. Start with the first tile in the corner of the grid and work outward. Set tiles one at a time using a slight twisting motion. Insert tile spacers as each tile is set. Fit perimeter tiles in each grid last, leaving 1/4" gap between tile and wall. When grid is completely installed, tap in all tiles with a rubber mallet or hammer and wood block, to ensure a good bond and level plane. Remove excess adhesive from joints with a putty knife, and from tile with a damp sponge. Do not walk on tiles until they are set (usually in 24 hours). Large size floor tile installation requires particular attention to proper subfloor preparation, grout joint sizing, trowel selection, and mortar coverage. It is absolutely critical that large tile be installed on a level substrate. Installation Requirement: For proper bonding, medium bed mortar should be used in installing tiles with a dimensional length greater than 15 inches on any one side of the tile. Back buttering tiles of this nature in the installation process will also assure proper coverage for body. High performance plank porcelain tile. For residential & commercial use.